Uploading photos to your Fluxiom account in real time could dramatically cut down on the energy and time you spend collecting feedback from your clients. By giving them access to a shared folder, and letting them watch the shoot as it unfolds, you are guaranteed to capture their attention like never before. It’s also a great opportunity to tighten the feedback loop, avoiding costly misunderstandings, and the frustrating re-shoots that go with them. And, finally, it provides you with a real time backup, just in case the studio’s sprinkler system decides it’s time for a wet hard drive contest. All you need to achieve fully automated, fully transparent uploads is a small Apple Script to glue together the Finder on your Mac, and the free Fluxiom Uploader you already use. By using OS X’s Watch Folders, you can turn any directory on your machine, including your camera’s destination folder, into a magic Fluxiom-enabled zone. Because Fluxiom accepts RAW files, and outputs them transparently as clean, web-compatible JPEGs, there is no need to run photos through a cumbersome batch converter before showing them to your client. Two-minute setup instructions can be found on our support pages. Obviously, you will need a fast upstream connection for the process to happen transparently, and you will need sufficient space in your Fluxiom account to accommodate the files. Otherwise, there is no limit on the number of files you can upload in this manner: as far as your account is concerned, this is a perfectly regular upload operation. We hope this tip will save you time and frustration during a very busy time for all creative professionals. As always, our support engineers. welcome your comments on this feature, and would be delighted to assist you in setting things up. In the spirit of continuous, steady improvement, we are happy to announce two tweaks to how Fluxiom notifies you of important events. These will not fundamentally change how you interact with the application but should, hopefully, further lubricate your workflow at critical junctures. Whenever you invite someone to join a Stage, Fluxiom emails that person with instructions and credentials to log onto the application. Once in a blue moon, this email got stuck in SPAM filters, causing a small but unnecessary amount of confusion. 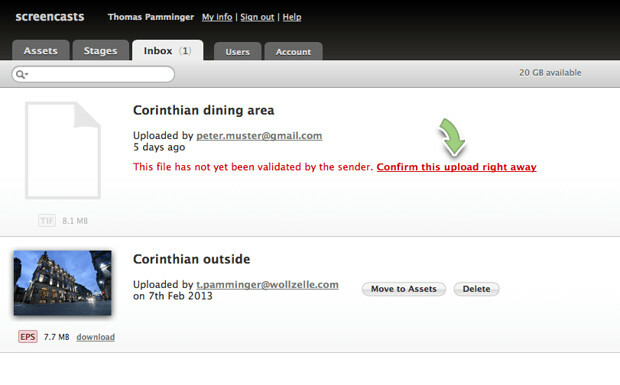 To side-step the problem, you will now receive a copy of the credentials that are sent to your guest. This effectively enables you to transmit these credentials easily from your own email address (which the guest already trusts) or through whatever alternate means you see fit. Whenever a third-party uploads files to your Fluxiom Inbox, they are sent an email asking them to confirm their upload. It could happen, however, that senders forgot to confirm their files, resulting in delays and frustration while Fluxiom waited for their green light. To alleviate the issue, the application will now display the files in your Inbox tab, and allow you to confirm them directly, without waiting for the sender to do so. As before, unconfirmed files will be automatically deleted after 24 hours, to prevent clogging.